Verse 3-7 tells us about God’s unique greatness. We have every reason to thank Him when we just think deeply that He is the One who made the sea, the mountains, the dry land and us. Therefore, He urges us in verse 11 to not harden our hearts or we will not enter His rest . How does trusting God connect with observing the Creator’s works and avoiding deception? Do you think it takes some effort for us to stand still and observe God’s works? Let’s consider just 3 from the excellent devotional, Inspired Evidence, by Bruce Malone and Julie VonVett. From January 7th – Why was Dr Semmelweiss ridiculed for doing what Scripture prescribed? From December 24th – What do Adam and Eve have to do with Christmas? 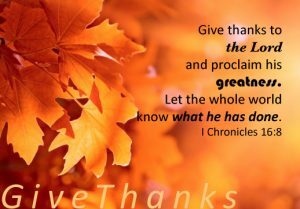 > From November 15th – What blessing can you thank God for every time you blink? There are endless examples of God’s wondrous works worth considering, aren’t there? Moses writes in Deuteronomy 10:12-13: “And now, Israel, what does the Lord your God require from you, but to fear the Lord your God to walk in all His ways and love Him, and to serve the Lord your God with all your heart and with all your soul, and to keep the Lord’s commandments and His statutes which I am commanding you today for your good?” Don’t miss the object of that declaration… In God’s perfect providence our response to rightly ‘fear God’ is all for our good. Does Jesus say anything to validate this requirement to “fear God” of His disciples? In John 14:23 “Jesus replied, “Anyone who loves me will obey my teaching. My Father will love them, and we will come to them and make our home with them.” That’s abiding isn’t it? Reading Psalm 94:5-7 I’m reminded of the harsh realities we all see in the wicked world today: “They crush Your people, O LORD, And afflict Your heritage. They slay the widow and the stranger and murder the orphans. They have said, “The LORD does not see, Nor does the God of Jacob pay heed.” Does this remind you of the flagrant excesses of humanistic – evolutionary secularism in today’s society? What follows tells me that God’s Merciful Invitation doesn’t excuse hard-hearted ignorance among his own people. Going on in Psalm 94, verse 8 offers a stinging rebuke: “Pay heed, you senseless among the people; And when will you understand, stupid ones?” If we’re wise sons and daughters we’ll receive the reprimand of our loving father and listen closely to His correction. Notice he appeals to reason based on the obvious testimony of His creation. Psalm 94:9 tells us: “He who planted the ear, does He not hear? He who formed the eye, does He not see? The essential part of the visual system itself: pupil, cornea, lens, retina, optic nerve, aqueous humor – wonders without number beyond what we can comprehend. One of the greatest impossibilities shaming those who deny a Creator is to explain how natural selection or random mutation could evolve such a phenomenally complex organ as the human eye. They forget that none of the hundreds of thousands of imagined intermediate mutations could have any value until the entire system was in place to allow vision to take place. The only rational conclusion is that God created the fully developed human eye when He created Adam and Eve. The eye is engineered far more precisely than a modern, sophisticated camera. In a manner similar to advanced cameras, the human eye displays advanced autofocus features with a remarkable ability to adjust the muscles of the iris automatically at a phenomenal speed. The lens of your eye modifies its shape through tiny muscles that allow the eye to correctly focus on an object that is moving toward you or away from you. This act is not unlike the workings of a sophisticated, computer-controlled modern camera when it calculates distances and automatically adjusts to bring the object into focus. The lens of your eye is constructed of microscopic and transparent living cells containing no blood. These cells allow light photons to enter through the cornea, pass through the fluid, and be analyzed by the phenomenal organ known as the retina. To understand the complexity and sophistication of the engineering of the eye, we need to appreciate the retina. The retina lines the back of your eye and acts as a form of film which receives the actual image composed of light photons passing through the iris, cornea and eye fluid. Your retina is thinner than paper yet its tiny surface (one inch square) contains 137 million light-sensitive cells. Approximately 95 percent of these cells are rods that can analyze black and white images, while the balance of approximately seven million cone cells are used to analyze color images. Each of these millions of cells are separately connected to the optic nerve that transmits the signal to your brain at approximately 300 miles per hour. The millions of specialized cells in your eye can analyze more than one million messages a second. The retina in your eye is the most light-sensitive object in the universe with more sophisticated in its design than even the most powerful electron microscope or spy camera. For example, the most advanced film available today can differentiate between a range of one thousand to one. However, recent experiments have confirmed that the retina of the human eye can easily differentiate and analyze a range of ten billion to one. Experiments have revealed that the retina can actually detect one single photon of light in a dark room, something beyond the range of engineering instruments. Recently, scientists have determined that the specialized cells in the retina actually partially analyze the image in the eye before it is ever transmitted through the optic nerve to the brain. These retina cells perform up to ten billion calculations per second in determining the nature of the image transmitted to the eye by light photons. No computers on earth are capable of matching these virtually instantaneous calculations. Psalm 94:16 continues: “Who will stand up for me against evildoers? Who will take his stand for me against those who do wickedness?” If nothing else, this is a divine call to active involvement with our fellow man, who interact every day with the systems of this world. Do you think God’s encouragement is based on His sovereign power to judge righteously? Psalm 94:19 goes on: “When my anxious thoughts multiply within me, Your consolations delight my soul.” Did you hear that? God’s Promise of Judgment for the wicked gives hope for His faithful children who endure. The Creator’s Work that He has made invites us to humbly rely on His Word. The only reason a Christ follower would have to fear man’s word above God’s Word is a lack of knowledge, particularly a lack of confidence in the authority of the Bible. That’s why we’re told to “study to show yourself approved of God, a workman that does not need to be ashamed.. (i.e. embarrassed or timid about believing the whole counsel of God). There isn’t a politically correct controversy in today’s world that doesn’t hinge on some aspect of the Bible. Will we fear man or fear God? Evolution – it all comes down to Exodus 20:11, the only commandment that gives us a reason for it. And the reason is the reality of the 6 days of creation 6,000 years ago, confirmed by Jesus when He said, “Haven’t you read that from the beginning, God made them male and female…” (Matthew 19:4 and Mark 10:6). Secularism – the cultural demand to eliminate God from public discussion. That reminds me of what Jesus said privately to His disciples before His death. In John 14:23, he said: “If anyone loves me he will keep My word and My father will love him, and We will come to him, and make our abode with him.” Just a few verses on, Jesus says in John 15:4: “Abide in Me and I in you. As a branch cannot bear fruit of itself; unless it abides in the vine, so neither can you (bear fruit) unless you abide in Me… apart from Me you can do nothing.” Is that enough reason for us to have fear of God rather than man? The Fear of God is mentioned more than any other aspect of devotion. The reverential awe, respect and fear of God must be the primary attitude of our Faith. Any concept of God that does not lead us to fear Him and obey His Law cannot be a Biblical view. Guess where this is found: ““Fear God and give glory to Him, for the hour of His judgment has come; and worship Him who made heaven and earth, the sea and springs of water.” It’s Revelation 14:7. The link from fearing God to the fact that He is the Creator makes me realize it’s no wonder that the greatest deception of the deceiver-devil himself is his relentless attack on the truth of Genesis. It’s exactly why the apostle Peter prophesied that scoffers in the last days would use their excuse of the fallacy of uniformitarianism to deny the six day Biblical creation and the global flood of Noah (2 Peter 3:3-6). As we Worship God alone how can we be confident He hears us? Who has the privilege of God’s Angels on assignment for Protection and Deliverance? Who has the promise of the Lord’s imputed righteousness for their grandchildren? Do you want Wisdom and Understanding? “He provides food for those who fear Him… He remembers His Covenant forever… the fear of the Lord is the beginning of wisdom; all who follow His precepts have good understanding.” Psalm 111:5, 10. His Forgiveness of Sins humbles us to fear Him. “…if You, O Lord, kept a record of sin, O Lord, who could stand? But with You there is forgiveness, therefore You are feared.” Psalm 130:2-4 Our awe for Him is beyond description. What is the Fountainhead of divine Virtues? Those Who Fear God humbly receive Knowledge and Accept Rebuke. We need to model for our children the fear of the Lord (Psalm 34:11). Fearing God isThe Essential Foundation for national Freedom and Justice. Until we learn to fear God, we will be enslaved to the fear of man. People-pleasers make traitors. We need to please God and be freed from the fear of man. The first time our Lord came as the Lamb of God who takes away the sins of the world. The next time – He will not come as a Lamb. He will come as the Lion and He will destroy His enemies. God’s precious promises really take root in the heart of a confident abiding believer, fearing God. The fear of man will prove to be a snare. The fear of God is liberating. The fear of God will enable us to stand firm when others are falling back. The fear of God will enable us to stand up when others remain seated. The fear of God will empower us to step out in Faith when others draw back in fear. The fear of God will empower us to fight the good fight of Faith when others surrender.